People visit the "Isak Heartstone", a 15-foot wooden troll by Danish artist Thomas Dambo, along the Wellington Trail as part Breckenridge Internationals Festival of the Arts Aug. 13, in Breckenridge. The homeowners in the Wellington Neighborhood wants the troll taken down. Breckenridge’s troll is a temporary art installation that invites people to venture into the wilderness in search of something special, but its lifespan could get cut short, as it appears the troll might soon fall victim to his own popularity. 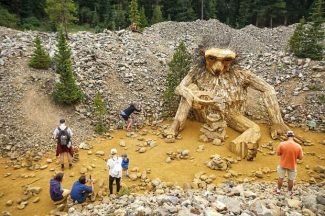 The buzz on social media has been intense since the roughly 15-foot troll, constructed of reclaimed wood, came to life about a mile up the Wellington Trail in Breckenridge for a summer arts festival. The troll’s name is “Isak Heartstone,” given to him by his creator, Danish artist Thomas Dambo, who’s built the sculpture for a $40,000 commission from Breckenridge Creative Arts for the Breckenridge International Festival of Arts, which ran Aug. 10-19. The idea has been to leave the troll up as long as he can withstand the weather and isn’t vandalized. Since its creation, the Breckenridge troll has been featured in news coverage by most of Colorado’s major TV news channels, radio stations and travel publications, along with this newspaper. With all that attention though, the troll has been taking a serious toll on some of the nearby homeowners in the Wellington neighborhood who are fed up with what they describe as “literally hundreds” of troll hunters coming into their neighborhood on a daily basis. This traffic has led to safety concerns, illegal parking and littering, a loss of privacy and a host of other issues, they say. A local public relations pro, Stewart said she appreciates a good PR campaign as much as anyone but has to side with her neighbors seeking to have the troll removed by the town. “It’s served its purpose,” said Drew Kosmowski, as he too asked town council to either remove the troll, reconfigure the Wellington Trail so it doesn’t run so close to people’s homes, including his, or better enforce parking and trespassing regulations in the neighborhood. The heavy foot and vehicular traffic has been more than a nuisance, added Brett Amedro, another Wellington homeowner. Addressing council, Amedro said his biggest concern rests with the safety of neighborhood children who play in the alleyways and how the added vehicle traffic will likely worsen come ski season. Other residents have the troll looking directly into their homes, Stewart and Kosmowski said, as they stuck up for one of their neighbors who couldn’t make the council meeting. It may be made of wood, but the neighbor isn’t enjoying living next to a troll that seems to stare into her home at all times. “Literally, the troll peeks over the berm and straight into her home, which is a little disconcerting to say the least,” Kosmowski told council. Illegal parking is another major problem, they said, and nighttime hikers haven’t gone unnoticed, as the flashlights they carry flicker through windows of the nearby homes. Because the trail sits on a berm, some of the homeowners also feel like they’ve lost a piece of their privacy because the hikers “have perfect surveillance into our homes from that trail,” Kosmowski said of the view. According to the president and CEO of Breckenridge Creative Arts, Robb Woulfe, the troll was more popular than they expected it would be. While he’s enjoyed seeing its widespread success, he said he empathizes with the homeowners who’ve been getting trolled by all the extra traffic it’s created. Moving the troll might not be an option, Woulfe said. Assuming they can find a suitable replacement site for the sculpture, he isn’t sure if the troll can be safely deconstructed and reassembled somewhere else. According to Woulfe, the town will take the lead on the future of the troll and BCA will go along with whatever the town decides. Woulfe hopes the positive impacts of the troll, including all the added exposure for the town and enjoyment so many people have been getting out of it, won’t go mute as the conversation continues to unfold, but he supports whatever the town decides. Meanwhile, a survey has been issued to help gauge public opinion on the troll and town officials will be meeting with the BCA to discuss the troll’s future in Breckenridge. The future of the troll is expected to come up again Oct. 23 at the next town council meeting.